What is the part of speech of 微 in the following? A dictionary says it's a verb while others say it's an adverb. Do these claims hold water? 微 should be an adverb here. 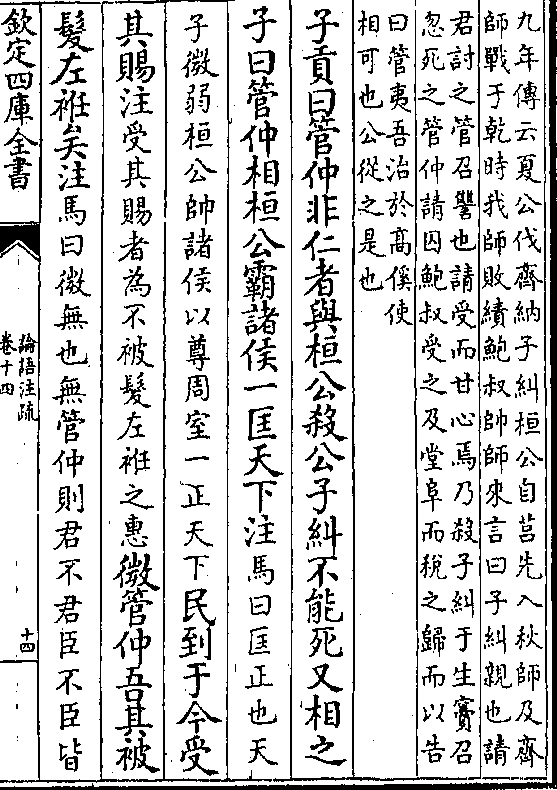 The sentence means "如果没有管仲的话, ..." (if there was no 管仲, then ...), and 微 is not an action here. if it's not / without (微) mr 管 (管仲), . . . There is an important characteristic in Chinese language: it often omits grammatical functors and particles. This phenomenon is extremely frequently seen in Classical Chinese, and still sometimes seen in Modern Vernacular Chinese. OK, now let me answer the question. If there were not Guanzhong, I would dishevel the hair and wear the clothes to the left. Consequently, 微 is the adverb “not”. 微 is here analogous to 無 or 沒, and thus can be considered a verb. Using 没有A，就B to mean "if we did not have A, then B would happen" is still a common phrase in modern Chinese. The main reason the sentence in your question is translated differently from other examples is because there is no good way to translate 無 or 微 into English as a verb. Thanks for contributing an answer to Chinese Language Stack Exchange! Not the answer you're looking for? Browse other questions tagged grammar word or ask your own question. What is the proper word order when a sentence contains an adverb using 地 and a coverb phrase? What does `只` mean in `他有四本书，可是我只有三本`? How is 着 pronounced here? How to determine the part of speech tags of words succeeding 不 like these? What is the meaning of 具 in 最具魅力的市区町村? How to express “tend to ~” in Chinese? What does this say in Elvish? How can someone know whether he/she is a Good QA or Tester? Is it possible for SQL statements to execute concurrently within a single session in SQL Server? What's the meaning of "fortified infraction restraint"? Is CEO the "profession" with the most psychopaths? If one coin toss yields Head, what is the PDF for the probability of a head?